It seems that everywhere you go, today’s agencies hear lots about Agile. Although even seasoned project managers may not be able to define just what Agile is, almost everyone agrees that it’s a working methodology that agencies should know and value. Other executives and project managers will ask: how can we change our current practices so that we can become more Agile? 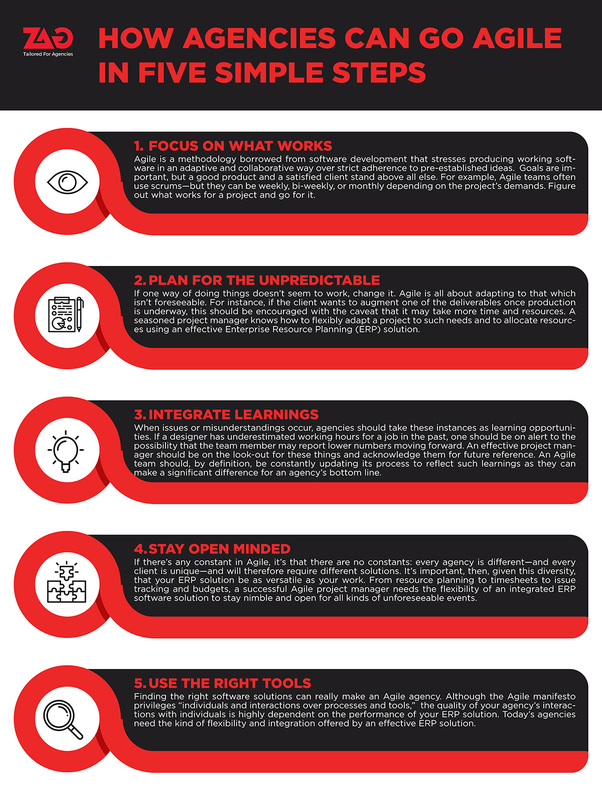 Here we’ll outline five important steps your agency can take to go fully Agile. Focus on what works. Agile is a methodology borrowed from software development that stresses producing working software in an adaptive and collaborative way over strict adherence to pre-established ideas. Goals are important, but a good product and a satisfied client stand above all else. For example, Agile teams often use scrums—but they can be weekly, bi-weekly, or monthly depending on the project’s demands. Figure out what works for a project and go for it. Plan for the unpredictable. If one way of doing things doesn’t seem to work, change it. Agile is all about adapting to that which isn’t foreseeable. For instance, if the client wants to augment one of the deliverables once production is underway, this should be encouraged with the caveat that it may take more time and resources. A seasoned project manager knows how to flexibly adapt a project to such needs and to allocate resources using an effective . Integrate learnings. When issues or misunderstandings occur, agencies should take these instances as learning opportunities. If a designer has underestimated working hours for a job in the past, one should be on alert to the possibility that the team member may report lower numbers moving forward. An effective project manager should be on the look-out for these things and acknowledge them for future reference. An Agile team should, by definition, be constantly updating its process to reflect such learnings as they can make a significant difference for an agency’s bottom line. Stay open minded. If there’s any constant in Agile, it’s that there are no constants: every agency is different—and every client is unique—and will therefore require different solutions. It’s important, then, given this diversity, that your ERP solution be as versatile as your work. From resource planning to timesheets to issue tracking and budgets, a successful Agile project manager needs the flexibility of an integrated ERP software solution to stay nimble and open for all kinds of unforeseeable events. Use the right tools. Finding the right software solutions can really make an Agile agency. Although the Agile manifesto privileges “individuals and interactions over processes and tools,” the quality of your agency’s interactions with individuals is highly dependent on the performance of your ERP solution. Today’s agencies need the kind of flexibility and integration offered by an effective ERP solution.